EVs might be more efficient, but there is no single fuel of the future. Hydrogen is either the wonder fuel of the future or a technological cul-de-sac. Toyota believes the former, and has spent the past few decades developing mass-market hydrogen cars. The automaker showcased what the technology can do, in the form of its Mirai Fuel Cell Electric Vehicle (FCEV), which launched in 2015. But while its Mirai might be the most visible use of the technology, it's by no means the only place these engines can work. If any company deserves a patient ear, it's Toyota, which led the way in creating a market for greener cars with the Prius. That gamble paid off, with 12 million Priuses being sold since it first went on sale in 1997. But Toyota's focus was never entirely on electric vehicles, and it has spent the better part of 20 years working on a fuel cell car. In the interim, however, battery-electric vehicles (BEV) suddenly hit the mainstream, and their rise may have surprised the company a little. From a slow start, mass-market EVs from the likes of Nissan and Chevy are generating small but consistent monthly sales. And then there's Tesla, which, production issues aside, helped EVs to shed their staid image. EVs are cool now, and analysts quoted by The Guardian say that there will be five million electric vehicles on the road by the end of 2018. For the past decade, Toyota's attention has been turned toward hydrogen, and in 2012 the company's then R&D chief, Takeshi Uchiyamada, went so far as to diss EVs. He said that the cars "do not meet society's needs," citing the short range and long charging times as barriers to adoption. 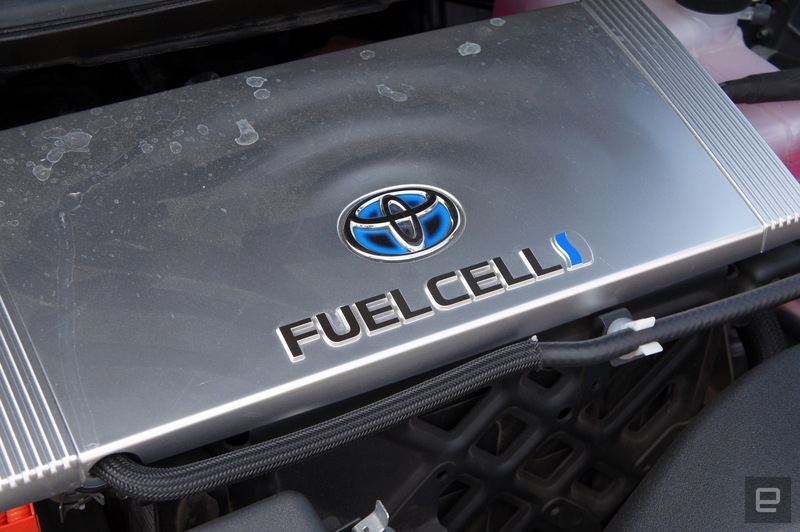 Since FCEVs refuel in minutes and have ranges similar to those of gas-powered cars, they are Toyota's future. The Mirai is Toyota's first FCEV that can be driven by regular people, although it's slightly hard to get one. It packs a polymer electrolyte fuel cell that can output a maximum 114 kW, connected to an electric motor and a battery. The fuel tank can hold around 5 kg (11 lbs) of hydrogen, which gives it a range of about 310 miles, depending on how you drive it. And when Engadget reviewed the Mirai in 2016, Roberto Baldwin said that the "car of the future drives like a Camry." In essence: a boring, conservative family car. As I drove through Germany and Denmark in the Mirai, I thought that it drove much more like a Prius than a Camry. The Mirai was built on the same platform as Toyota's influential hybrid, albeit with the engine swapped out for the fuel cell. Toyota's intention is to ensure that there's no culture shock when swapping to a FCEV: It behaves just as you expect. At least so long as you're expecting an elegant ride without face-melting acceleration. 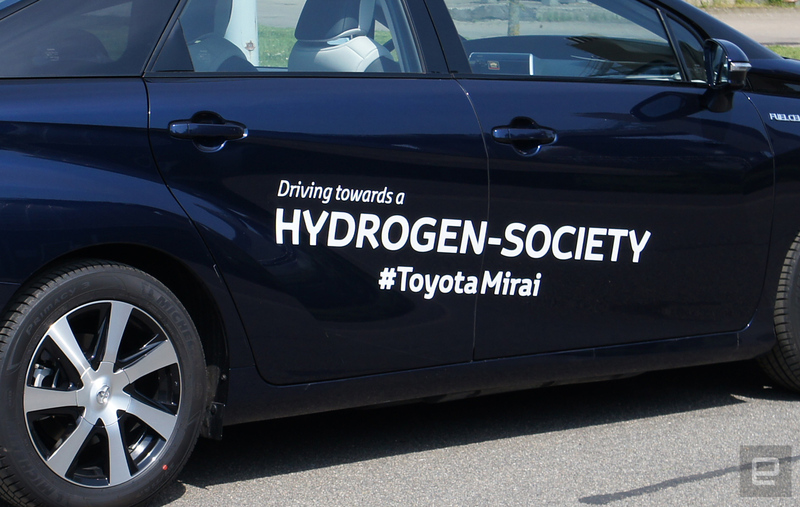 Since going on sale, the Mirai has sold 5,500 units globally, with around 250 of those selling in Europe. You can buy one only in areas where there is hydrogen infrastructure, and California and Japan make up the bulk of the sales of the $60,000 car. Most folks have wound up leasing the vehicle, since Toyota can offer various incentives to woo early adopters. Toyota hopes that, much like the Prius, subsequent Mirai models will be cheaper thanks to better economies of scale. Hydrogen's practical benefits are easy to explain: It's only a little slower than pumping gas, and it can be stored relatively easily and safely. (Although, unlike gas tanks, which are buried beneath the stations themselves, the hydrogen equipment has been installed aboveground.) The first station I toured had lost the equivalent of three parking spaces to the pumping and storage tanks. There's also relatively low risk of an explosion, no matter how much you may worry about the Hindenburg. Toyota and others are also pushing the idea that hydrogen could be used as a store of excess renewable energy. Periods of sustained wind generate energy that grids can't handle, and so is sold on at almost no cost, or else wasted. Some communities have seen success using large battery packs to store this power, and there is a hope that EVs could become home batteries in the future. But these technologies have been tested only in relatively small or remote communities, like on the Hawaiian island of Kaua'i. The biggest implementation of the system is probably Australia's 100-megawatt "big battery," which serves a community of 30,000 homes. By comparison, New York City uses 11,000 megawatts of energy, which is bigger by a factor of 110. It's thought, however, that if this wasted renewable energy were hooked up to an electrolyzer, it could produce hydrogen for very little money. In theory. Of course, all of the effort to create, transport, store and sell hydrogen has been undercut by one crucial problem. EVs, which are becoming an ever greater part of the transport equation, cut out the middleman, since you can charge them at home on your own electricity supply. For plenty of urban commuters, that reduces any need to visit a filling station on a regular basis. Stijn van Els, head of Shell's various German businesses, conceded that the oil industry simply can't compete. "If you live in a city, and your journey is short," said van Els, "then buy an EV." Toyota, Shell and others have begun to concede that there's little point in building a small FCEV for short urban trips. When you can fill up on your home energy bill for pennies and your journeys are short, there's little incentive to spend money on a fuel source. 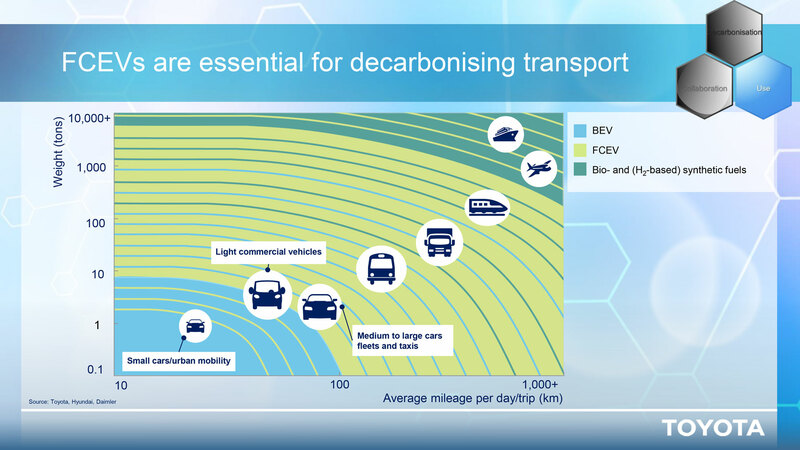 This slide from a Toyota presentation, for instance, says that small, "urban mobility" vehicles are better suited to batteries than to fuel cells. In the Mirai, I burned around a kilogram of hydrogen to travel 100 kilometers -- in American terms, that's 2.2 pounds per 62 miles. 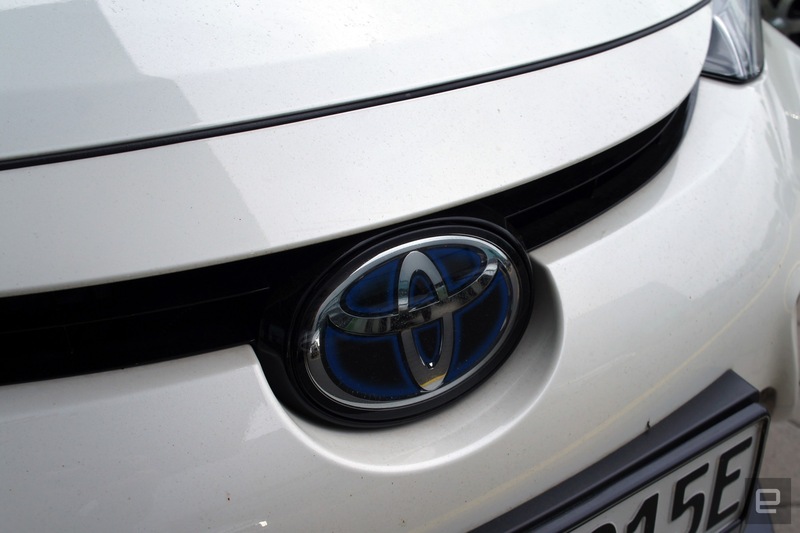 (Toyota's official figures are a little more generous: 0.69 kg per 100 km in urban areas, and 0.76 kg combined.) As for the price of hydrogen, in mainland Europe (where I was driving), the fuel is subsidized and costs between €9 and €11 (an average of $11.75) per kilogram. For comparison, gasoline costs around $6.05 per gallon in Europe, and a typical sedan like Ford Fusion gets about 40 miles to a gallon, making a 300-mile trip cost $45, as opposed to $57 with hydrogen. And as for that cost? "More than half" of the cost to produce "hydrogen is the cost of electricity," said Lars Jacobsen, a project manager at NEL Hydrogen, a company that builds hydrogen infrastructure. Countries that have embraced renewable energy, like Denmark, Norway and Sweden, can already produce hydrogen that's as cheap as gasoline. Shell, too, says that it can currently produce hydrogen at €3 ($3.54) per kg and hopes that number will fall further in future. EVs are a harder sell for longer trips, especially in countries that don't have fast-charging infrastructure. That is where Shell's van Els believes that hydrogen as a fuel has a place, both for those people who "live further out" and those who "travel further." Van Els added that "the fuel and drivetrain for mobility will depend on what you're looking for." In the future, there will not be a single fuel that we are all using all of the time: It'll be much more tailored to your needs. Transportation businesses, for instance, lose money when their vehicles sit idle, and that's a problem if you're spending an hour a day at a charger. "Even 15 minutes is too long for a taxi," said van Els. 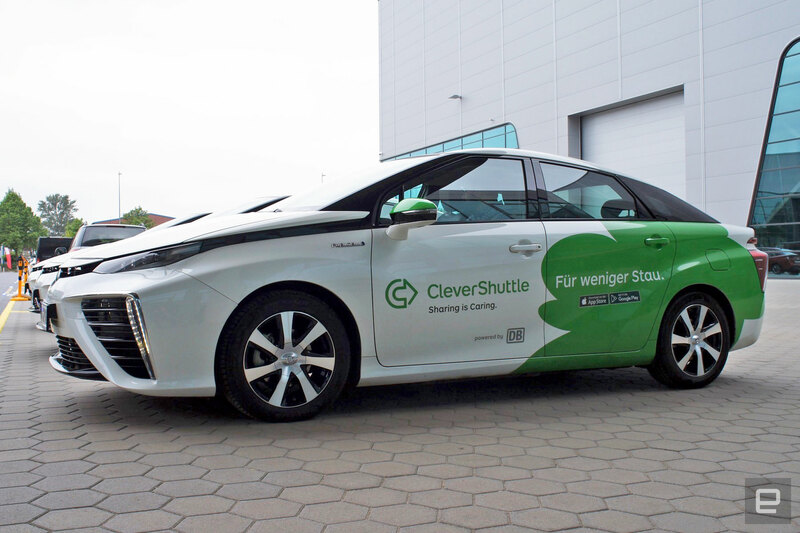 German transportation startup CleverShuttle owns and operates a fleet of environmentally friendly vehicles for its customers, which includes FCEVs. The company, which works like Uber and UberPool, offers close to 40,000 journeys a month. It currently operates 80 Mirais spread across four of its cities -- Hamburg, Berlin, Stuttgart and Munich -- with a Frankfurt service coming soon. CleverShuttle's Jana Dargel explained that the faster refueling time of FCEVs is vital to making them profitable. It's also beneficial to Toyota, which has intentionally sought out high-profile fleet operators to lease its initial Mirai units. The automaker has leased 11 cars to London's Metropolitan Police, which will use them both as marked and unmarked pursuit vehicles. Individuals can lease a Mirai, but Toyota has focused its efforts on companies, to avoid the vehicles' sitting in garages. A car gathering dust behind a locked door won't generate interest from or encourage energy companies to add more hydrogen pumps to their filling stations. And more infrastructure is vital to the success of FCEVs, especially in order to banish the ever-present range anxiety for vehicles not using gasoline. I got a glimpse of that: Road construction in Germany meant that my Mirai test drive involved a couple of long detours, which burned through more hydrogen than expected. My last trip to a fueling station was a stressful one, because you can't simply fill a jerry can with hydrogen when you stall out on the highway. By the time I arrived at the next station, I had just 46 km (28 miles) left in the tank. Not that an EV is any better, unless your recovery service offers a truck with massive battery packs. 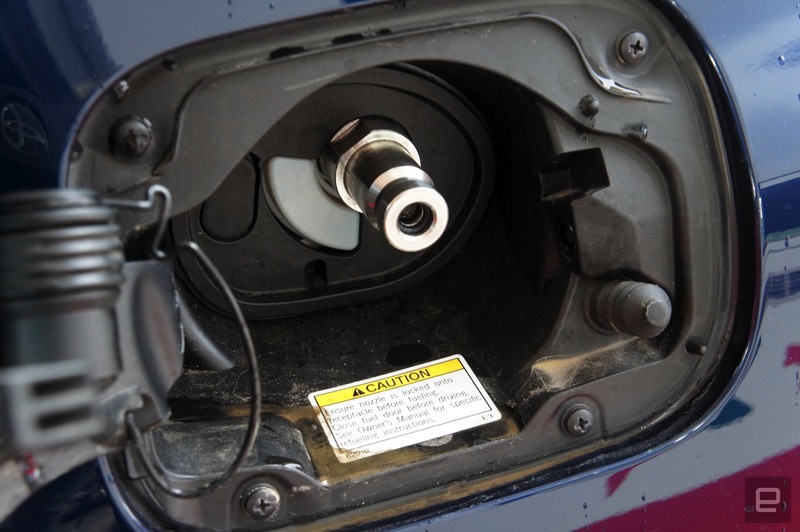 Fueling a FCEV isn't the same as pumping your own gas, but there are lots of similarities. With the Mirai, you need to open the fuel cap, pull off the safety cork and push on the fueling nozzle, pulling the handle to create a seal. A gentle tug, to make sure it's on tight, and you can wander over to the pump itself. Tell it at what pressure you want your hydrogen delivered and hit the start button. The system will run an initial safety check before filling your tank up to the brim with sweet, sweet H2. Hydrogen and batteries both carry an environmental cost that means neither can be called entirely green. For all the piety surrounding BEVs, current battery-manufacturing processes mean that, during construction, they're almost as bad for the environment as traditional cars. It's only when they're out on the road that the situation begins to improve. The majority of hydrogen is not created using renewables, either, but is mass-produced with steam-methane reforming. The system uses natural gas (not renewable) and high-temperature steam to create carbon monoxide and hydrogen. Steam reforming means that you're left with a big pile of carbon monoxide to deal with, but that methane also has a tendency to leak. It can escape from both the factory, when it is created, and from the pipelines used to transport it, and methane is one hundred times more damaging to the climate than CO2. Decarbonizing the economy will be for nothing if these leaks aren't brought under control or stopped completely. 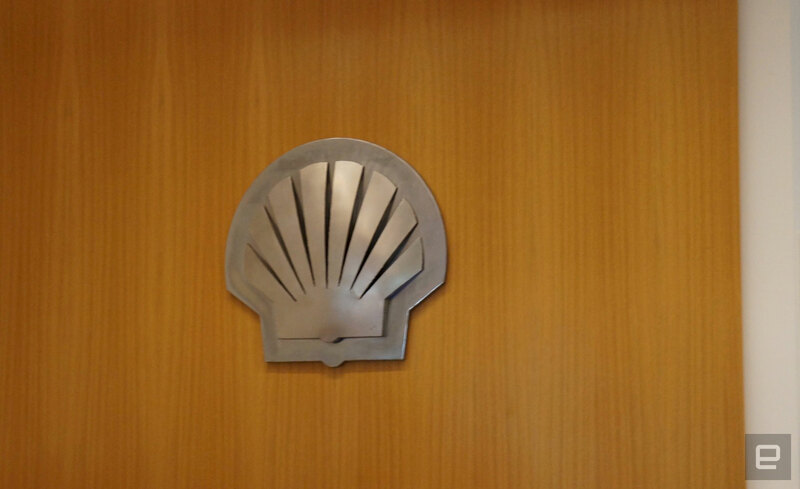 With that in mind, Shell is building an electrolysis plant on the side of an existing steam-methane reformer. The company is aiming to get a 50/50 split on the balance of green hydrogen it can produce, although van Els hopes that figure can reach 80 percent in the longer term. The problem "has to be dealt with," said Thomas Hwan Jensen, a policy adviser at Energinet, the body that owns Denmark's gas and electricity transmission system. "Methane leakage is being addressed," he added, showing that the energy companies at least understand the issue. If there are positives, it's that there are systems in place that could mitigate some of the damage caused by carbon dioxide. 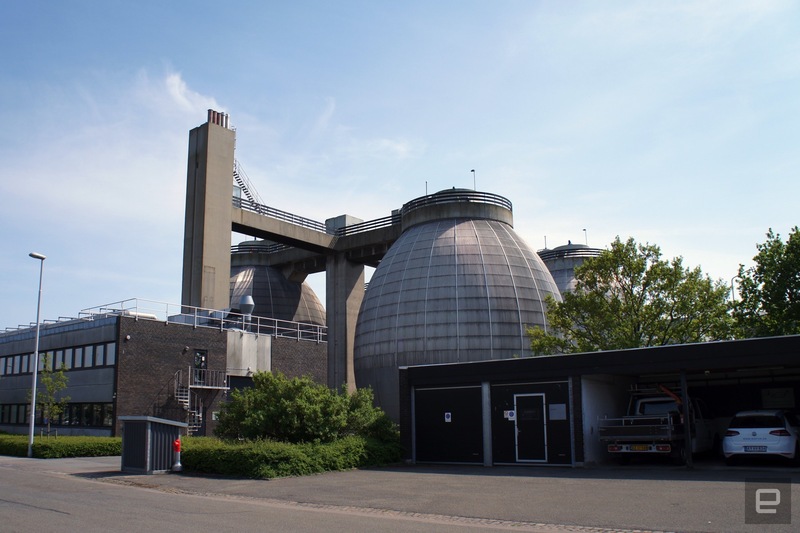 Denmark's BioCat Project (pictured), for instance, uses a biological process to turn carbon dioxide and hydrogen into synthetic natural gas for use in power stations. It's still emissions-heavy, but, if powered by renewable energy, it could be a better way to generate power than, say, more coal-fired stations. Of course, any solution that doesn't involve burning fossil fuels is better for the environment; this isn't any defense of the oil industry. It's just important to understand that there is no wonder fuel that is entirely free from downsides. Hydrogen's ideal place seems to be in medium-size vehicles, where the trips are long and the loads are heavy. Fleet vehicles, mid-range sedans, SUVs, vans, trucks and trains could all benefit from a shift in fuel. After all, it can be stored similarly to gasoline, with a better energy density, and is theoretically cheaper than bulky batteries. Alstom is working on a hydrogen train that could replace diesel-powered fleets across the globe as a far cheaper alternative to rail electrification. Toyota is already running a hydrogen-powered big rig out of the port of Los Angeles, called Project Portal. NEL Hydrogen's Lars Jacobsen said that the fuel cell technology is "mature" enough for use in heavier industry. He added that, while "cars are fantastic, they don't make the business case" (for it). It's his belief that it's in trucking that hydrogen will make the biggest initial impact, and his company is already working with Nikola Motors. Nikola has secured a pretty extraordinary deal with brewer Anheuser-Busch, which has pre-ordered $9 billion worth of hydrogen trucks. Eight hundred vehicles are expected to be pressed into service, starting in 2020, each one capable of traveling 1,200 miles before refueling. The trucks could serve as the catalyst for a new, America-wide hydrogen-refueling network, with 700 stations anticipated, which would hopefully encourage the production of more hydrogen-powered consumer vehicles. Meanwhile, is there a place for hydrogen in the aerospace industry? The image of the Hindenburg engulfed in flames remains a powerful one, even today. Hamburg's Center of Applied Aeronautical Research has already found that it would be feasible to build a drone plane fueled by hydrogen. Airbus, too, is looking at ways to incorporate hydrogen into the aircraft of the future, in place of kerosene, although such a decision would require all aircraft to be radically redesigned. 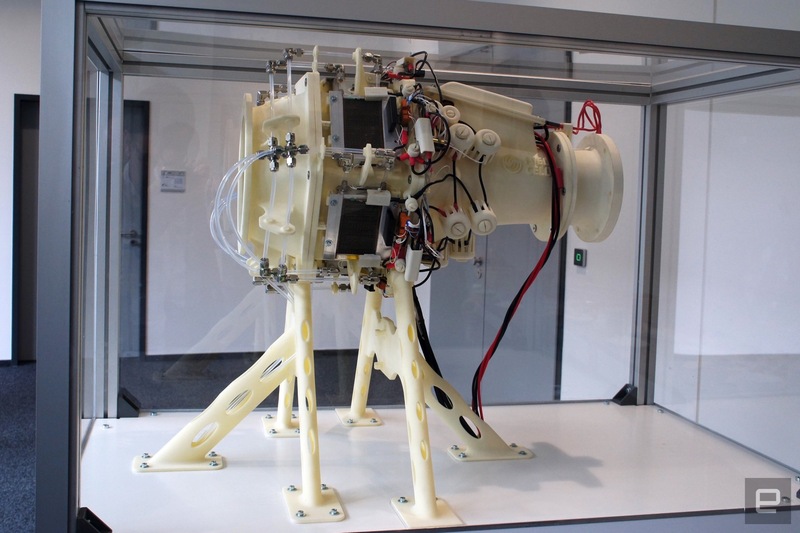 At present, it has built a demonstration "imponator" (pictured), a 3D-printed model of a fuel cell that could replace an aircraft's kerosene-driven auxiliary power unit. This system traditionally drives the plane's air conditioner while in flight, but it's not likely to reach service in this half of the century. The company's Jörg Tappermann said that in the airline industry, the "relevance of a decision can take between 60 and 95 years." Choices that are made now will have a lasting impact in the centuries that follow, so there's reluctance to make a mistake. Shell's German communications chief, Axel Pommeraenke, believes that "for the foreseeable future, all fuels will be needed," especially with a growing global population. The company's Stijn van Els said he is often asked which -- EVs or FCEVs -- "is going to win," and his response is that he "doesn't know" but that Shell will do its best to sell the power to make them go. "We need these fuels to be a success," said van Els, "because we want people to buy energy from Shell, and we want to be around by 2050." There is a sense that every company is trying to avoid another HD DVD vs. Blu-ray scenario (or VHS vs. Beta, if you're older). Although the comparison isn't necessarily apt, because what Toyota is going to great pains to show is that there won't be a single winner. There can't be. Instead, the hope is that we'll be able to choose the energy that best suits the requirements of the job, rather than being chained to the altar of oil. And, of course, we need to move away from oil as quickly as possible, if only to avoid an ecological catastrophe. Theory, however, is only half of the problem: Toyota has proved that it can build an FCEV, and on May 24th the company pledged to ramp up production. The company says that if not by 2020, then shortly after it, it will have produced 30,000 fuel cell electric vehicles. (For comparison, in 2017, Toyota sold 1.52 million "electrified vehicles," which includes hybrids.) Now it has to show that it has a compelling enough case that consumers will open their hearts, and wallets, in practice.